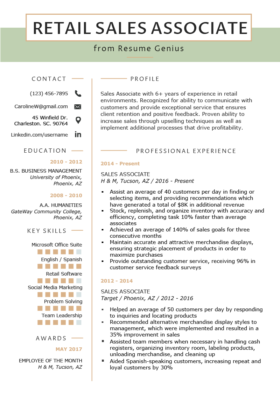 Not sure how to write your cashier resume? No problem! 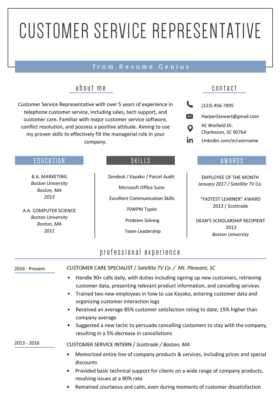 Our cashier resume writing tips and free downloadable example will help you write your own with ease. Head Cashier with over 7 years of experience in providing excellent customer service, handling daily accounts and maintaining inventory. Aiming to use my knowledge and expertise to effectively fill the managerial role in your store. Possesses a Bachelor’s degree in Arts. The job of a cashier is a hard one. Not only do you have to work under high pressure situations, but customers can get touchy when it comes to others handling their money. When writing your cashier resume, be sure to emphasize your customer service abilities, as well as other skills that you’ve picked up over the course of your career. Want more? Find all the action verbs you need, here. The career objective sets the tone of the resume and thus deserves special attention when writing your resume. Draw upon all recent experiences or transferable skills you have to customize a career objective that hits the nail on the head with skills like the applicant in the excerpt below. What is a Career Objective and why do I Need One? With this addition, the applicant reassures the hiring manager that they won’t require an abundance of training. If you don’t have any experience that’s still ok, as long as you list communication skills and the “ability to learn quickly” you should remain an attractive candidate. Cashiering is a very popular profession amongst students and recent graduates because it provides convenient scheduling and flexible hours required of those with other obligations. Pay rates are reasonable for this part-time position. Also, Cashiering, while requiring many useful skills, can be very easily taught and many start through in-house training programs where veteran Cashiers explain the trade to new hires. Before the training process however, attaining employment begins with building a resume, and the Entry-level Cashier resume begins with the education section. Follow the tips outlined below to write a resume that land you more interviews. Writing a resume without much professional experience can be difficult, especially for students just entering the workforce. The entry-level resume above stands out as strong because its educational section details four major accomplishments. 1. It’s critical to start off by declaring your major or subject of study, especially if it’s relative to the position applied to. This candidate lists their BA in English. 4. Demonstrate your skills and abilities. This candidate’s education section ends on a particularly strong note by mentioning being the “Founder of the Cornell Chess Club”, an addition that indicates leadership, critical thinking and strategizing skills. To read more about how to write the Education Section, click here. 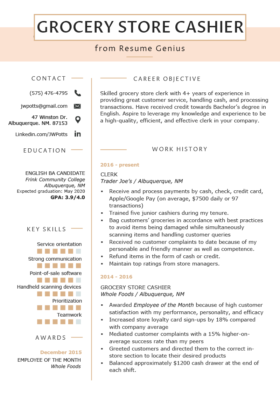 By using the above tips and advice you should, regardless of experience level, should be able to craft a Cashier resume sure to grab the attention of any retailer looking to grow their team. To get the job, you need an attractive and persuasive resume. Let our online resume builder do all the hard resume writing for you. It will even automatically format everything into HR-recommended resume templates. Give it a try now. Don’t forget a cover letter and thank you letter to follow up with, or to practice your interview skills!